When shopping for the best printing services provider, many companies will typically take factors such as cost and range of services into consideration. But, as the Internet and digital devices make their way into day-to-day communication and business operations, there is another area of print that is becoming increasingly important for organizations to pay attention to: document security. The exchange of information is pertinent to operational success. Paper products are used every day in nearly all industries, from legal and finance to education and automotive. Each has a wide range of documents that contain sensitive information, including contracts and records, insurance forms, certificates and titles, and banking and deposit slips. And as more companies begin to use electronic systems for communication and storage purposes, protection and security are becoming major concerns. To ensure the safety of both internal and external information and compliance with regulatory standards, businesses must ensure they are doing everything in their power to prevent exposure at all levels. Having a security breach can not only lead to financial loss or regulatory fines, but serious reputation damage and loss of business as well. 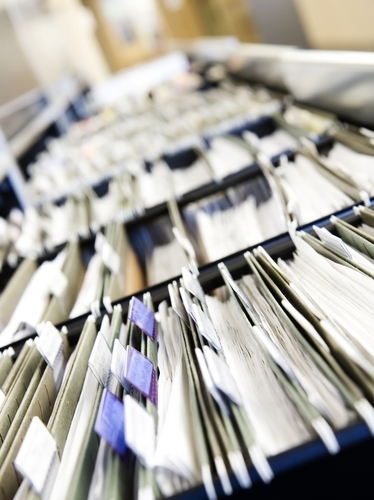 One field that is especially focused on document protection is health care. In the past few years, data security breaches and patient information violations have been a major issue, with some of the industry's most well-known organizations falling victim to hacks. This month, Redspin published its sixth annual Breach Report on Protected Health Information, or PHI. The research found that, since 2009, 154,368,781 patient health records have been breached. Between 2014 and 2015, there was a record-setting 897 percent increase in such reported occurrences. The majority, or 98.1 percent, of the records affected last year were due to a hack or issue with IT. The report also revealed that paper or film were a contributing factor in 26.3 percent of the cases in 2015. There are many layers and functions involved in optimizing an organization's data privacy and protection processes and a much-needed demand for improvement. With an increasing number of companies using electronic systems, the complexities and complications of security are expanding. At the IT level, health care providers need to utilize best-in-class software and anti-malware systems to avoid exposure. HealthITSecurity.com recently pointed out that one of the most frequently neglected aspects of IT in medical settings is printer security. According to the source, there are a handful of strategies that can be used to help reduce the chances of a breach: For example, working with a printing services company that adheres to the highest level of industry regulations, compliance and safety standards. Furthermore, the article explained, control management tactics should be implemented in printing processes to regulate who can access the printer, which will also provide a way to track and audit activity. And these are not the only printer-related solutions that can be used to improve document security. It is highly encouraged that staff members always make sure records and sensitive materials are kept in a safe, secure place. But is not just where these papers are stored that plays an important role in risk mitigation. The type of physical products used in medical settings can also help enhance protection. One paper item health care companies must be especially careful with and protective of is prescription pads. Organizations must prevent people from copying or scanning prescription forms and erasing or altering the information on them. These pads should possess at least one of the three features outlined by the Medicaid Tamper Resistant Prescription Law: one that protects a blank form from unauthorized copying, one that will prevent any information from being erased or modified or one that will defend against counterfeiting activity on the prescription pads. Working with a printing services company that offers built-in security features is an effective way for health care companies to reduce the likelihood of fraudulent behavior. Below are some innovative solutions that can be used. Visible or invisible fibers. There are invisible fibers that can be embedded and printed at random on both sides of a paper material that will prevent the product from being copied or reproduced. In addition, fluorescent fibers that are visible only with UV lighting can be employed. TechMark PenTick Plus. This is a type of propriety document security functionality that reveals a temporary mark on the document only when a TechMark PenTick Plus is applied to it. Indicator stains. Chemical reactive paper can be used to reveal counterfeit attempts by showing evidence of attempts to alter the document. Furthermore, particular strains can be used so that, if the product comes in contact with certain agents, it will indicate that someone tried to change the contents. Choosing the appropriate printing services provider can be challenging for organizations today, but it is an essential component of both success and security. By working with the right company, health care organizations can safeguard themselves against counterfeit, fraud and security breaches.